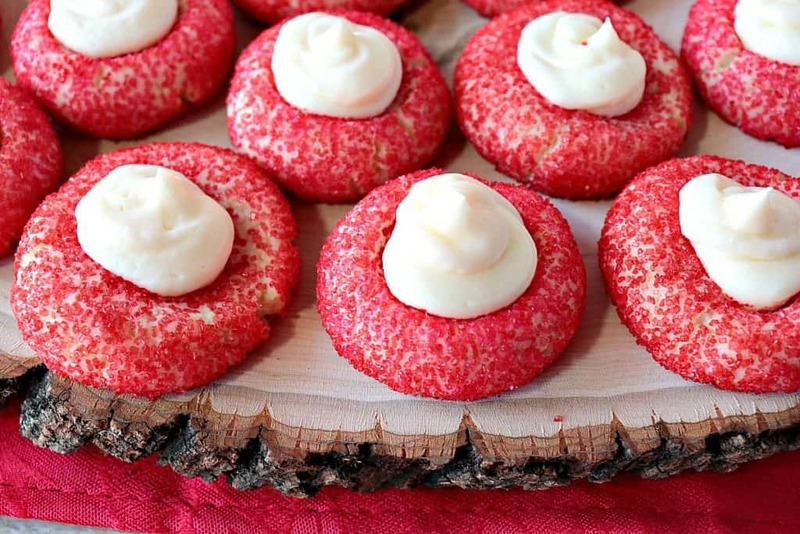 What makes these Cream Cheese Cookies doubly delicious is the creamy cheesecake dollop on top! When you can’t decide between cookies or cheesecake, this is the treat for you! 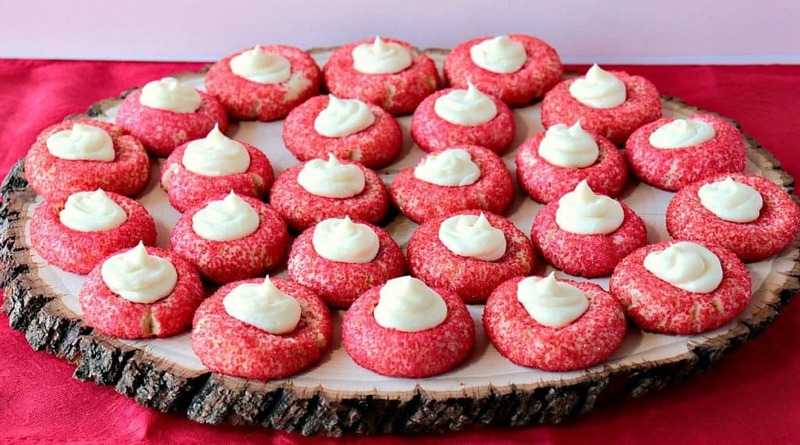 This recipe idea came about just recently as I was contacted by one of my readers who unfortunately was disappointed by the consistency of my Christmas Cream Cheese Sprinkle Cookies. I suspect since cream cheese is in the title of the recipe, he’d expected the cookie to have a cheesecake-like consistency, and not be crunchy like a cookie. 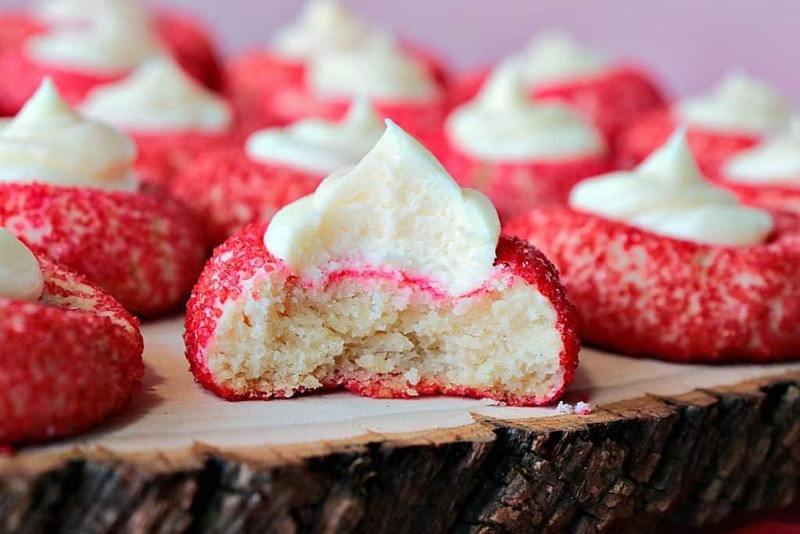 Since I’m all about keeping my readers happy and satisfied, I decided to work up a new recipe for these Cream Cheese Cookies with Creamy Cheesecake Topping just in time for Valentine’s Day. I know you’re going to LOVE these new cookies because they’re the best of both worlds!! 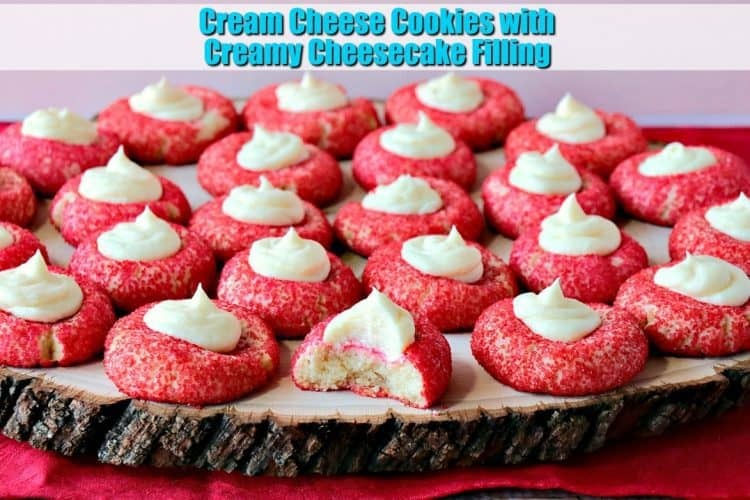 The ingredients needed to make these Cream Cheese Cookies with Creamy Cheesecake Topping are as follows. Butter, cream cheese, powdered sugar, vanilla extract, salt (please don’t omit the salt), all-purpose flour, colored sugar (optional), sweetened condensed milk, and lemon juice. That’s it! I used my stand mixer to blend all the cookie ingredients, but a bowl and a hand mixer will work fine too! Let’s begin making the Cream Cheese Cookies. Your family will be delighted when you serve them tonight for dessert! Why Wait? Cream together the butter and cream cheese. Add the vanilla extract and powdered sugar. Blend to combine. Add the flour to the bowl and blend just until a semi-stiff dough forms. Roll the dough into balls approximately 1″ in diameter and place on a parchment lined (optional) baking sheet. *Note – If not using parchment paper (or a Silpat silicone mat), spray the baking sheet lightly with baking spray. 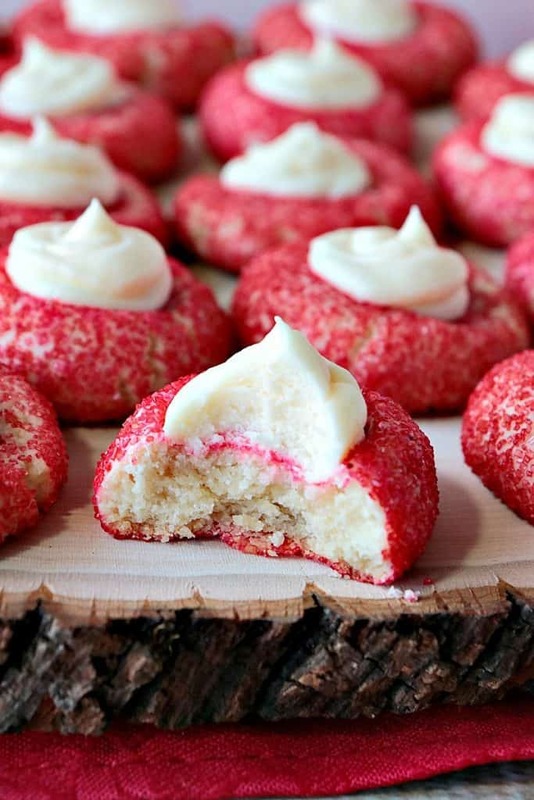 Roll the cookie dough balls into colored sugar (optional) and return them to the baking sheet. Flatten the cookies lightly with a spatula or a flat bottom measuring cup. Press an indentation in the center of each cookie using your thumb or another item that fits the center of the cookie ball and gently press to form a well. Bake the cookies in a preheated 350-degree oven for 18-20 minutes. *Note – the cookies are not meant to brown. Cool the cookies completely on a wire rack. Continue with the remaining cookie dough. To make the cheesecake topping, blend together cream cheese, sweetened condensed milk, and lemon juice until smooth and creamy. Spoon the cheesecake filling into a piping bag, or zip-top bag snipping off about ¼” of the corner. Pipe the cheesecake filling into the center of the baked and completely cooled cookies. Store in an air-tight container and refrigerate any leftover cookies for up to 5 days. 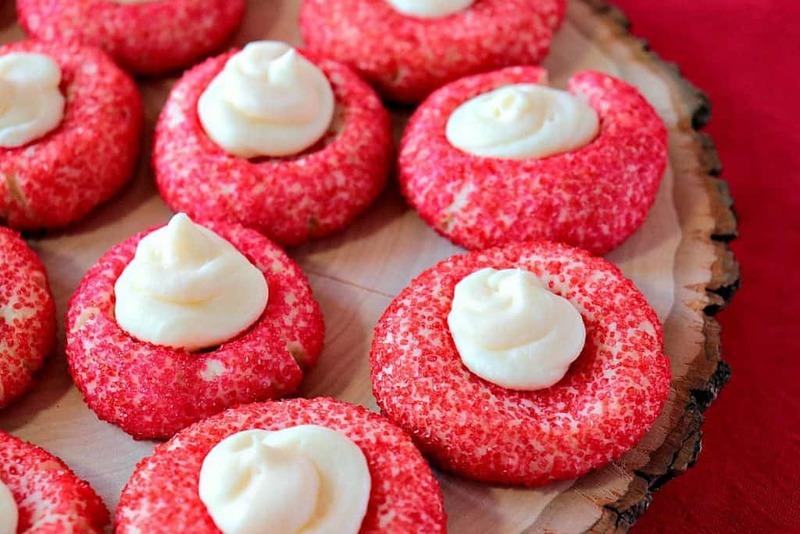 What makes these Cream Cheese Cookies doubly delicious is the creamy cheesecake dollop on top! When you can't decide between cookies or cheesecake, this is the treat for you! Add the confectioner's sugar and vanilla extract and blend until smooth. Add the flour and salt and blend until the dough just comes together and all the ingredients are incorporated. Roll the dough into balls approximately 1" in diameter and then roll the balls into colored sugar (if desired). Place the dough balls onto prepared baking sheets and flatten each ball lightly with a spatula. Press an indentation into the center of each cookie using your thumb or another small device. Bake the cookies in a preheated oven for 18-20 minutes. Remove the cookies and cool completely before adding the cheesecake topping. In a medium bowl, blend together the cream cheese, sweetened condensed milk, and lemon until smooth and creamy. Add the cheesecake topping to a piping bag or zip-top bag (snipping off a small piece of the corner) and pipe the cheesecake topping into the center indentation of each cookie. Store the cookies in the refrigerator for up to 5 days, if needed. I hope you’ve enjoyed this recipe for Cream Cheese Cookies with Creamy Cheesecake Topping as much as I’ve enjoyed bringing it to you. Should have any questions regarding this post or anything else you see on my site, please don’t hesitate to contact me directly, or leave me a comment in the comment section below. It is always my distinct pleasure to get back to you with a reply just as soon as I possibly can!